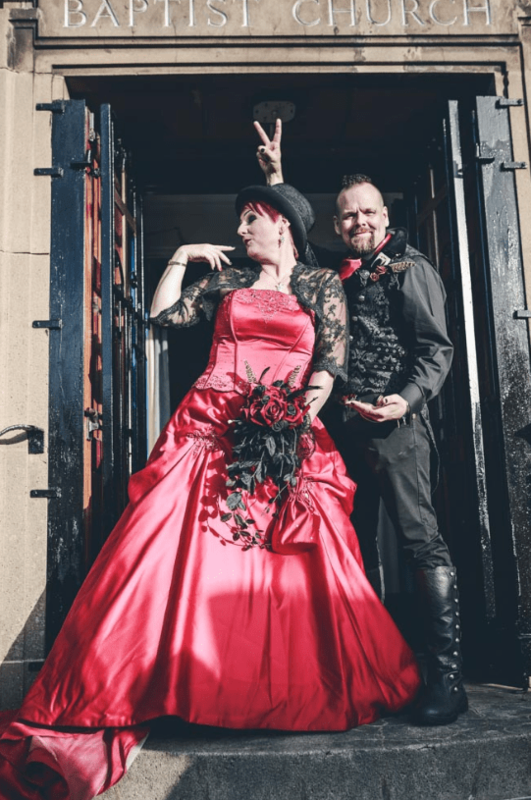 Mandy and Dean met online and, after dating long distance, Dean proposed to Mandy at the top of Beeston Castle, where they’d had their first date. 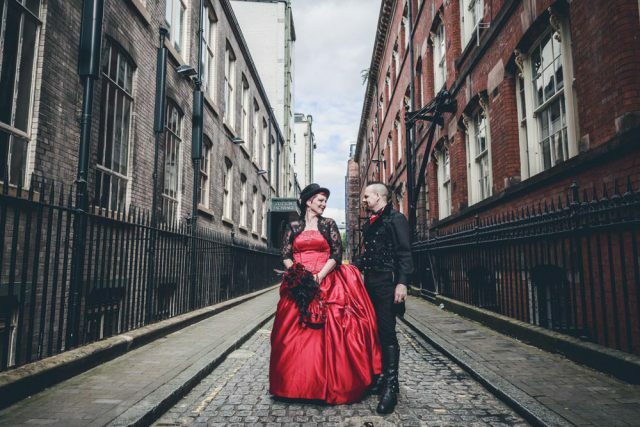 Their wedding theme was steampunk meets Alice in Wonderland with a bit of Mad Hatter and pirates thrown in. 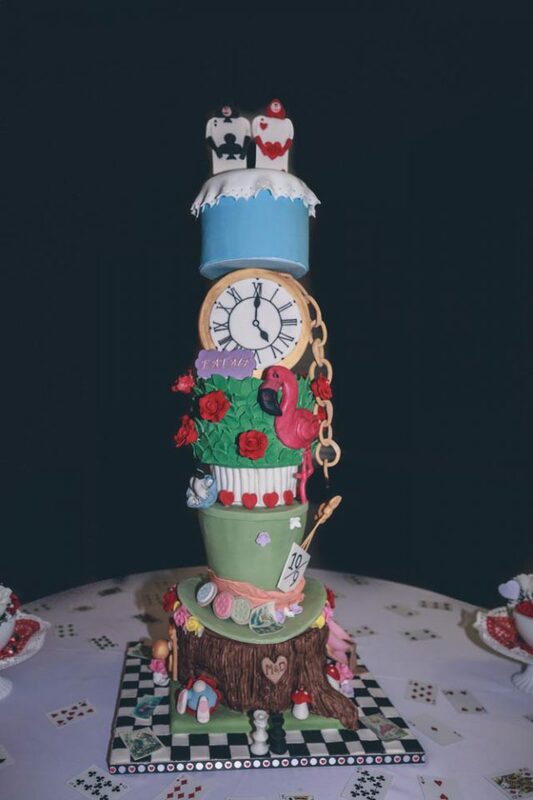 They were also inspired by the quote ‘We’re all mad here’ from Alice In Wonderland, which is also Mandy’s family motto! The ceremony was a traditional Baptist ceremony officiated by one of Mandy’s childhood friends, and was one of her favorite parts of the day. 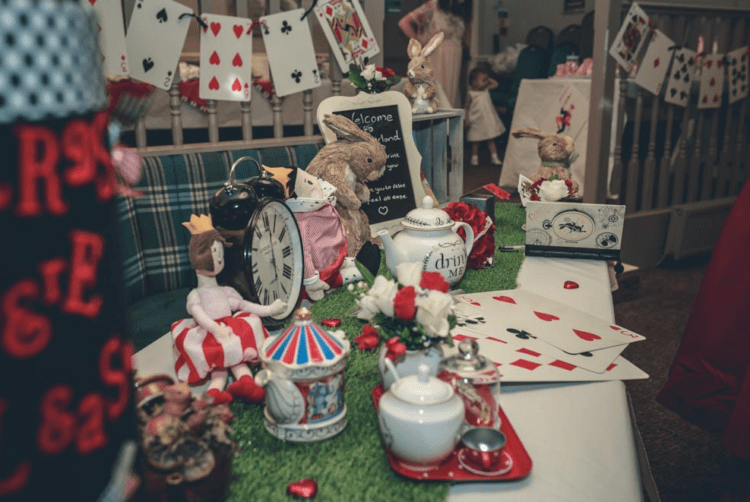 For the reception the couple decided to have a Mad Hatter’s tea party. 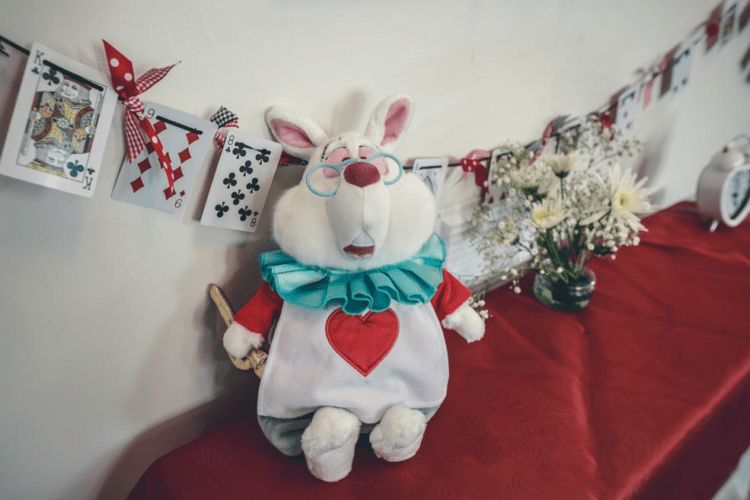 The decor was truly an amazing family DIY project: everything was handmade. It was hard work but it really helped keep our costs down and produced incredible results. The bride’s mum made most of the decorations herself from scratch and came up with all the ideas, she’s so creative and talented it’s untrue! 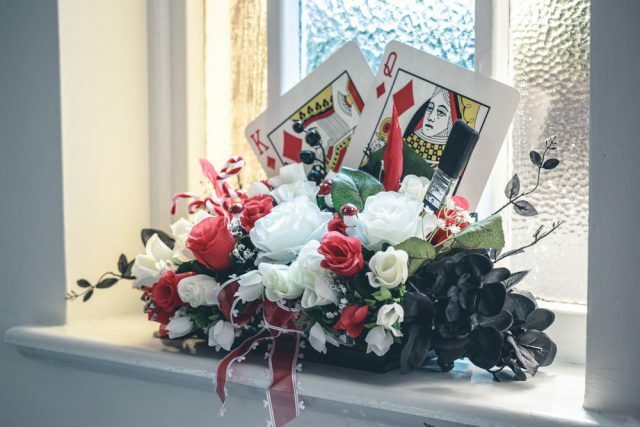 She made bunting out of playing cards and ribbon, our top hat post box and created the floral table decorations using large glasses we picked up in a bargain shop. 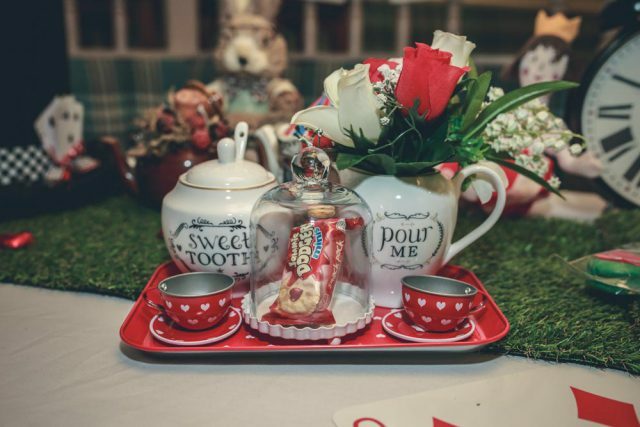 The couple collected all the vintage tea cups with the help of family and friends scouring second hand shops and markets, then put them together with artificial flowers and added fans made from playing cards and pheasant feathers to match the buttonholes and the wedding bouquet. The food was kept simple and informal, and there was no seating plan either, everyone was just asked to choose a table and sit where they were comfortable. The couple dressed up again the next day to continue the celebrations. 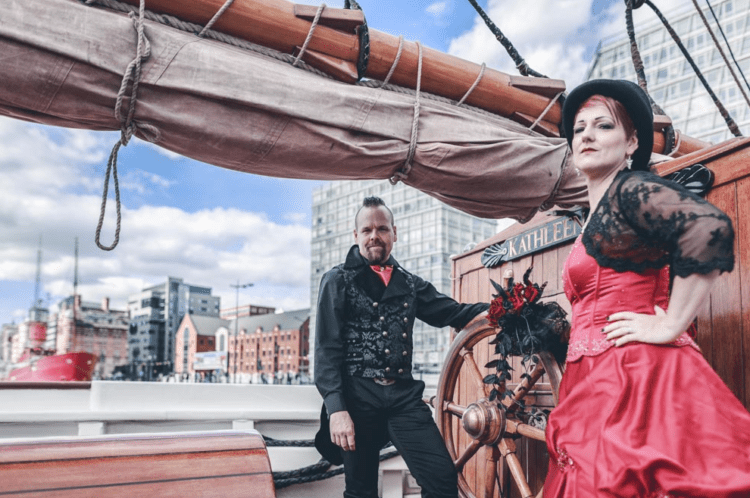 They went to the Pirate Festival at Liverpool’s Albert Dock. 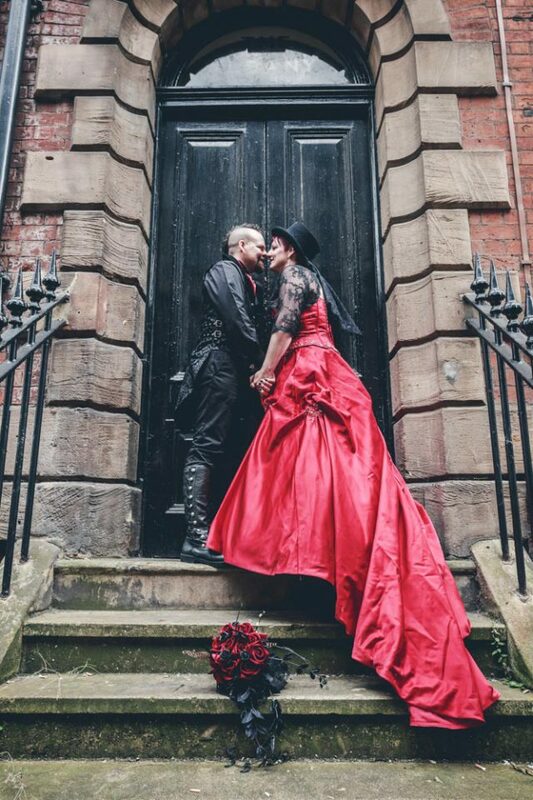 It was surreal walking through the city center in our full wedding outfits, then mingling with all the pirates!